Description: RMS Titanic Lifejacket recovered from the debris field. Feel free to visit http://www.henry-aldridge.co.uk for more information about Titanic artifacts and upcomming auctions. 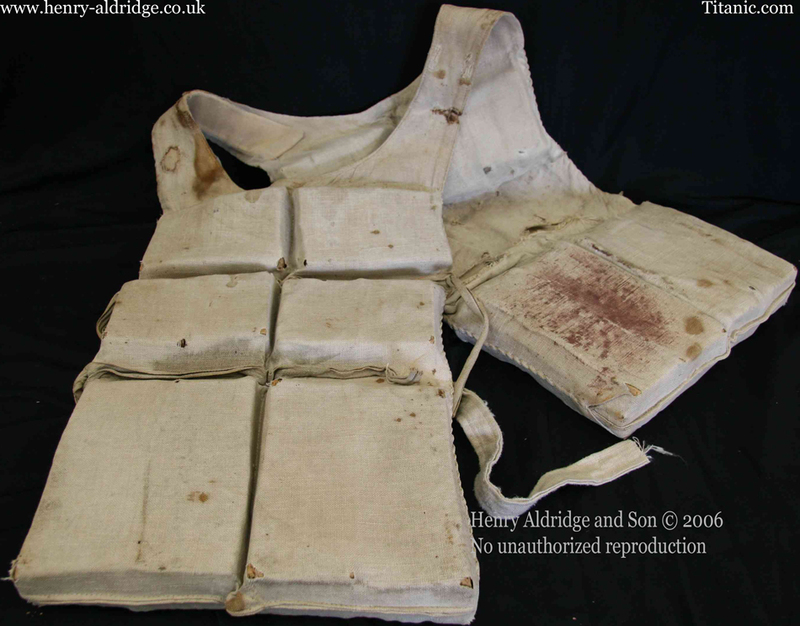 The star of the sale, this lifejacket from the Titanic which is without doubt one of the rarest items to be offered for auction from the ill fated liner in recent years. It is one is one of only handful of examples worldwide and was picked up by the Mackay Bennett, one the vessels chartered by the White Star Line in the days after the disaster in April 1912. The lifejacket has been on display in a number of museums in North America since the 1970ÃƒÂ¢Ã¢â€šÂ¬Ã¢â€žÂ¢s. More recently it has been on show in the Wonders Exhibition in Memphis and at Titanic Ship of Dreams in Orlando, Florida. This incredible item from that fateful night is estimated at Ãƒâ€šÃ‚Â£30000-Ãƒâ€šÃ‚Â£40000. But this is only one of the objects on offer, another very rare piece is an eight page letter from First Class Passenger Edward Colley, Colley was mentioned several times in the manuscript that realized Ãƒâ€šÃ‚Â£48000 in Henry AldridgeÃƒÂ¢Ã¢â€šÂ¬Ã¢â€žÂ¢s April 30th Titanic sale. The letter itself gives a unique snapshot into life on board the doomed liner and also the class system in existence at the time, Mr Coley wrote the letter dated April 10th with tongue firmly in cheek at times! Contact the auctioneers on +44 1380 729199 or visit www.henry-aldridge.co.uk for qualified, confidential and professional advice regarding any item relating to Titanic, White Star Line, Cunard or Ocean Liner Memorabilia.